Huawei's P20 Pro makes strides in still photography, but falls short in other areas. Huawei hasn't had a significant presence in North America, and if you saw the company's phones in the past, you might have wondered what the fuss was about. That's entirely fair, as the Chinese giant's earlier smartphones often looked like iPhone knockoffs in the way that Samsung phones one did. But in 2018, Huawei’s global popularity actually allowed it to surpass Apple in smartphone sales, and its most recent flagships reflect a bolder effort to carve out a distinct space in smartphone design. The Huawei P20 Pro makes strides in the flagship smartphone space in two key ways: the camera and the styling. The triple-camera setup has incredible zoom functionality and an amazing level of detail, while the colorful glass backing options give these phones a unique design in a sea of similar-looking devices. The P20 Pro has a different flavor than some of the other premium smartphones on the market—but is that enough to warrant a purchase now, almost a year after the initial release? We spent more than a week with the Huawei P20 Pro, marveling at its glossy exterior and snapping lots of photos. Here’s what we found out. Shot with Huawei P20 Pro. From the back, the Huawei P20 Pro is one of the most beautiful phones we've ever laid eyes on. Our unit has the stunning Twilight gradient color, and the rear of the device is a panel of gleaming glass that transitions from purple on the top to blue on the bottom. With the three cameras aligned along the left border and just a little bit of subtle branding, the back is mostly left blank for your visual appreciation. Even the aluminum frame has a light purple hue to match the backing. Huawei has other gradient colors on offer, including Morpho Aurora, Pearl White, and Pink Gold, and there are more typical Black and Midnight Blue colors available if these distinctive options are a bit too flashy for your taste. We're not quite as impressed with the front design, however. Huawei attempted to follow Apple's iPhone X approach by using a camera notch at the top to skim off bezel around the screen, but then still left the fingerprint sensor at the bottom. The screen itself is pretty nice (more on that later) and the notch is much smaller than Apple's, but it just doesn't feel like Huawei went far enough to deliver the kind of cohesive design we’ve come to expect from premium flagships. The P20 Pro is sold with either 128GB or 256GB of internal storage and unfortunately does not support microSD cards for expandable storage so you're limited to whatever you start with. Also, the P20 Pro doesn't have a 3.5mm headphone port, so you'll have to use the included USB-C adapter dongle to connect traditional headphones or earbuds. You can also use the bundled USB-C earbuds or connect wireless Bluetooth headphones. The handset has an IP67 rating for dust and water resistance (up to one meter). The Huawei P20 Pro is pretty easy to set up. After choosing your language and agreeing to the terms and conditions, you'll set usage permissions, connect to a Wi-Fi network or use the cellular connection, and check for phone updates. From there, it's a matter of deciding whether you want to use a saved backup from another phone or set the P20 Pro up as a new device, and signing into Google. Then you’ll need to choose between screen lock approaches, including facial scanning and fingerprint recognition. After that, you're all set. Note that the Huawei P20 Pro isn't officially sold in the United States, although the international unlocked version will work with GSM networks like AT&T and T-Mobile (but not Verizon). It may not come with an American wall plug, however, so you might need to order one or substitute one from another handset. We charged ours with Samsung and Apple power bricks and had no issues. Interested in reading more? Read our article on Huawei. The P20 Pro uses Huawei's own Kirin 970 chip, which debuted in 2017 and matches up well in benchmark testing to Qualcomm's Snapdragon 835 processor (the chip used in many other 2017 Android flagships). However, the P20 Pro released in early 2018, and with the first 2019 phones rolling out with the Snapdragon 855 onboard, the P20 Pro is now about two steps behind. While not top-of-the-line in this regard, the P20 Pro is still a pretty swift phone most of the time. But there are little hitches along the way. Speedy arcade-style racer “Asphalt 9: Legends” would reliably hang for a moment every few seconds during play, while battle royale shooter “PlayerUnknown's Battlegrounds” would get very choppy on the game’s default visual settings. 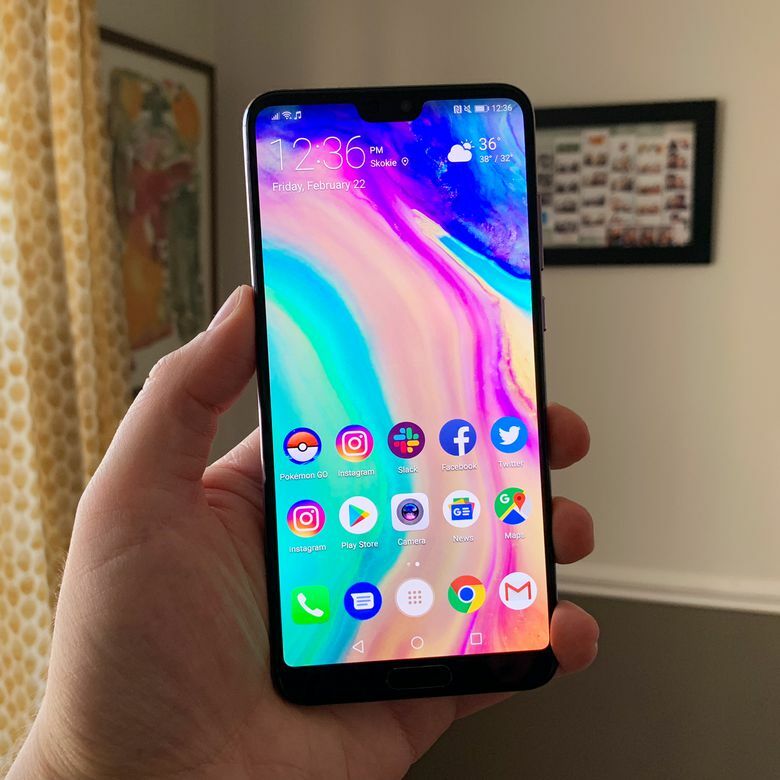 The screen itself is pretty nice … and the notch is much smaller than Apple's, but it just doesn't feel like Huawei went far enough to deliver the kind of cohesive design we’ve come to expect from premium flagships. Elsewhere, a simple act like changing the phone's wallpaper takes several seconds to complete. The phone is fast most of the time, but shows some inconsistencies. Surprisingly, the GFXBench Car Chase benchmark test showed 22 frames per second on the P20 Pro—a little better than the Samsung Galaxy S9 and Galaxy Note 9 (19fps each), despite steadier game performance from Samsung's phones in actual usage. The P20 Pro did score below those phones in the PCMark Work 2.0 benchmark, however, with a 7,262 score. The Galaxy S9 notched a 7,350 and the Note 9 landed at 7,422 in that test. Take a peek at some of the other best Huawei phones you can buy. We used Google Fi service, which combines T-Mobile, Sprint, and U.S. Cellular networks, for the Huawei P20 Pro. While we had a good experience browsing the web, downloading apps, and streaming media, Ookla Speedtest numbers were inconsistent. We saw a range between 11-18Mbps outdoors and 3-5Mbps indoors, with about 11Mbps upload indoors and 12-15Mbps outdoors. Even indoors, we saw good download speeds in normal usage, but it wasn't showing well on the test. With Wi-Fi, the phone supports both 2.4Ghz and 5Ghz networks. The screen resolution on the Huawei P20 Pro is lower than many other flagship phones, sticking with a 1080p panel for its 6.1-inch OLED display. Despite the lower PPI, it still looks nice, with the OLED technology lending it punchy colors, well-defined contrast, and strong black levels. Even so, closer inspection reveals that the text and interface are a bit fuzzier than they would be on phones with Quad HD displays. Additionally, while the display is still pretty easy to see in daylight, the screen doesn't get as bright as newer top-of-the-line phones from the likes of Apple and Samsung. Interested in reading more? Take a look at companies offering 5G availability around the world. The P20 Pro produces very good stereo sound, with audio coming from the bottom speaker and the earpiece on the front. It gets pretty muddled at the higher volume settings, and the Samsung Galaxy S9 and Apple iPhone XS Max can get a bit louder before sacrificing clarity, but the P20 Pro is plenty powerful if you just want to play music for yourself in the kitchen or office. Dolby Atmos virtual surround support is automatically engaged when you use the speakers, although the Atmos-boosted results on the Galaxy S9 and Galaxy Note 9 sounded a bit more robust to our ears. We didn't have any complaints about call quality—everything sounded clear through our earpiece, and people on the other end also had no problem hearing us. The Huawei P20 Pro made waves in early 2018 as the first big flagship phone to feature three back cameras, and it lives up to the hype in that regard—photos are impressively detailed, and the zoom functionality is a fantastic perk. Featuring lenses from Leica, the P20 Pro has a 40-megapixel main RGB camera at f/1.8 aperture, a 20MP monochromatic lens at f/1.6, and an 8MP telephoto lens at f/2.4. You can shoot at 40MP to capture extra detail, but it's set by default at 10MP (and it's worth sticking to that). At 40MP, you can't use any of the zoom functionality, plus the 10MP setting benefits from "pixel binning," a technique that combines the data from multiple pixels to produce typically cleaner results. With good lighting, the P20 Pro delivers crisp, colorful shots with plenty of detail. We recommend turning off the Master AI feature, which automatically switches between multiple camera modes to choose the best based on your subject or surroundings—while it occasionally improved the result (like when we were photographing a sunset sky), the images often looked blown out and over-processed. You're better off sticking with the standard setting, or manually choosing another. Photos are impressively detailed, and the zoom functionality is a fantastic perk. The phone's Night mode is also impressive. It opens up the shutter for a few seconds to give you a long exposure shot that the phone’s software optimizes. Not every night shot is a winner, but the best results easily beat those of rival handsets when it comes to lighting, color, and clarity. Only the Google Pixel 3's newer Night Sight feature seems to have a solid advantage when it comes to low-light photography. Despite all these camera features, we still think the 3x optical zoom and 5x hybrid zoom are best part. Many recent phones offer 2x optical zoom, but that's not a huge difference in distance—bumping it up to 3x feels like a significant amount of zoom, and the results remain very clear. You can also use a hybrid 5x zoom that adds some digital zoom atop the optical distance. You're likely to see a little bit of noise in those shots, but even so, this 5x option is better than any 5x zoom we've seen on a smartphone before. Despite its strengths with still shooting, the P20 Pro isn't quite as accomplished when it comes to video recording. It can capture clear and vibrant 4K footage, but you'll sometimes see a bit of stuttering. It doesn't handle movement as well as other top phones like the Galaxy Note 9, and probably isn't the phone of choice for the amateur videographer. The front-facing 24MP (f/2.0) camera takes very good selfies, although things get a little murkier when playing with software settings like the background-blurring Portrait mode or the skin-softening Beauty mode. Check out our guide to the best front camera flash apps. Beyond the triple-camera setup, the Huawei P20 Pro's other standout non-design feature is the enormous 4,000mAh battery pack. That's the same size as the cell in the Samsung Galaxy Note 9, but that phone has a larger, higher-resolution screen to power. On an average day with moderate usage, we never dropped below 50% battery by the end of the evening. For the P20 Pro, the results are particularly impressive. On an average day with moderate usage, we never dropped below 50% battery by the end of the evening. The P20 Pro is built to handle a pummeling of games and streaming media, so you can feel confident in making it through a full day even with heavy usage. And if you go easy on it, you could very well string together two days between charges. Even though it has a glass backing, the P20 Pro does not support wireless charging. The P20 Pro puts Huawei's own EMUI skin atop Android Oreo, and while the functionality of Android still shines through, it's not one of the most attractive takes we've seen. It lacks the elegance of Samsung's interface or the swiftness and simplicity of Google's latest stock Android approach. It works fine, but it doesn’t have the visual spark or polish seen in rival skins, and doesn't match the allure of Huawei's quickly-improving hardware design. By default, the P20 Pro uses the familiar Android software navigation bar at the bottom of the screen, but you can switch it to a gesture-based system reminiscent of Apple's OS for the iPhone X/XS if you choose. It's not as smooth or as seamless, but we got the hang of it pretty easily. Even so, the navigational bar still felt like the best option. The Huawei P20 Pro was not released in the United States, but the official Canadian price as of this writing ($1,129 CAD) converts to about $850 USD. That's in the same price bracket as other large 2019 flagship smartphones like the Google Pixel 3 XL ($899) and Samsung Galaxy S9+ ($840). With the P20 Pro, you’re paying a high-end price for a high-end product. It's been about a year since the P20 Pro's release, so you can find an unlocked international version for about $625 on Amazon as of this writing. That's certainly a more palatable price, but there are more powerful and better-rounded handsets available for even less. Samsung is all about polished, premium devices, and that's definitely true with the Galaxy S9. While the S9's design might feel a bit dated by the rapidly-evolving competition, it still has one of the best screens on the market, a much more appealing take on the Android OS, a more powerful processor, and microSD support for expandable storage. The P20 Pro has more camera perks onboard (although the Galaxy S9 does well with its single shooter on the back) and Huawei's phone comes out ahead on battery life, too. Still, the Galaxy S9 feels like the more refined and cohesive experience, and you can find it a bit cheaper than the P20 Pro these days. We think it's a better option overall if you’re looking for a slightly older flagship at a lower price. Need some more help finding what you're looking for? Read through our best smartphones article. A beautiful device with a great camera, and lots of inconsistencies. There's a lot to like about the Huawei P20 Pro, from its compelling triple-camera setup to the extensive battery life and dazzling backing glass. However, there are inconsistencies too: the front design isn't as sleek as the back, the processor comes up short on occasion, and Huawei's take on Android isn't very distinctive. Product Dimensions 0.3 x 2.9 x 6.1 in.